We live in NY- LI and love spending time in Stratton, VT. We enjoy skiing, biking, hiking, golf and all other family friendly activities the resort has to offer. Excellent location, walk across to lift with great amenities! Also an ice skating pond right at the door! Very family friendly. Excellent location. Clean and spacious apartment. Great choice of sports & leisure activities within walking distance to Ski Village- shopping, places to eat and ski lifts. We enjoyed our stay. The condo was very clean and comfortable. We really enjoyed our stay here, the location is ideal. It is close to the village but separated from the main access road so it has a more relaxing vibe than the Long Trail House. It is an easily accessible corner unit and located very close to the pool. Additional parking would be nice but parking an extra car across the street in Lot 1 wasn't much of a hassle at all. I would recommend this rental to anyone who enjoys Stratton. Stayed here for a mid-week ski trip and couldn't have asked for more. Upon arrival it was great to be able to keep our car parked inside the garage rather than leave it in the outside elements, and we were able to use their locker they have in the garage to keep our ski equipment. The condo was extremely clean and spacious. 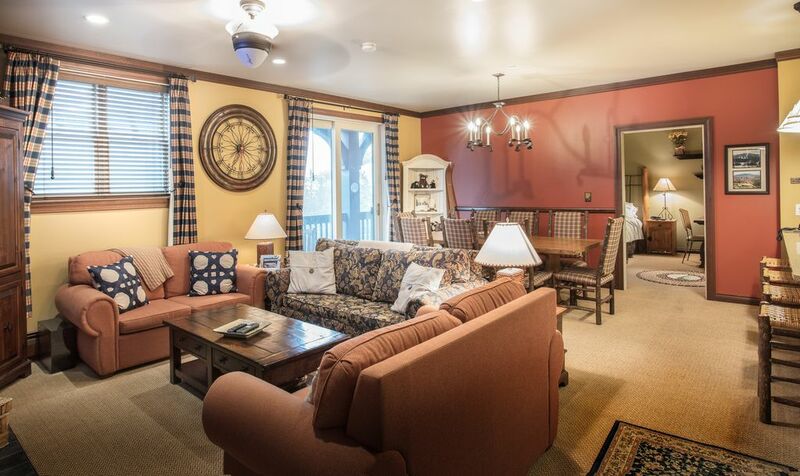 They had a large binder in the condo which had info on everything, from the wifi, using the tv, fireplace, restaurants and activities both on and off the mountain. Great to have all that information so readily available. Condo is a short 5 minute walk to the base of the mountain, but on the weekends they also offer a shuttle service right from inside of the garage to the base. We called to see if it ran on weekdays, but instead it ran direct from the lodge where you get the room keys, but service was great and offered to have us picked up from rising bear lodge as you just need to request it on the weekdays. Very accommodating but we opted for the short walk. Having the village at the base of the mountain was great to have for a post ride drink. Came back into the village one night to have dinner as well. Also, having an outdoor heated pool, jacuzzi, and sauna, right outside the condo was a nice touch to end the day. Will definitely be staying here again. We were very pleased with this condo. It was spacious, clean and well decorated. Being very close to the ski lifts, restaurants etc made everything much easier. Owners were responsive and made our stay very comfortable. Would happily stay here again. Spacious well decorated and fantastic location!!! My family and friends loved our long weekend at Rising Bear 210. From the moment the kids walked in they were thrilled with the bear theme. My youngest daughter especially loved the big fluffy bear next to the fireplace. Beautiful unit, fantastic location to walk to the slopes or take the shuttle from the parking garage. Absolutely enjoyed the pool and hot tubs. Definitely will book with you again soon. Rising Bear 210 is located at the base of Stratton mountain, directly across form Stratton Village. It is a beautiful year round resort with many things to do all year long. Skiing, snowboarding, cross country skiing, snow shoeing, and all winter fun to Hiking, Yoga, Biking, Nature hikes, Fly-fishing, Rafting, boating, tennis, golf and much more! Or just take in nature in the outstanding winters! The Spring ? The cool relaxing Summer, with many special events, concerts, golf course, wanderlust Yoga, Tennis academy, and much more! Or just relay and get out and hike or walk and view nature at its best with the change of seasons in the Fall! 15 minutes from Manchester Vt for great outlet shopping and world class restaurants! Something for everyone in the family!